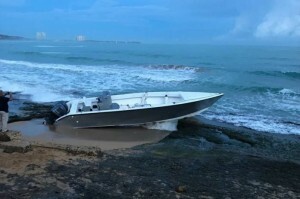 SAN JUAN - US Coast Guard and Caribbean Border Interagency Group (CBIG) law enforcement authorities seized 2,324 pounds of cocaine, worth an estimated $30 million, following the interdiction of a go-fast vessel on Saturday off Luquillo, Puerto Rico. Coast Guard Watchstanders in Sector San Juan alerted CBIG partner agencies of the developing situation, while the Donald Horsley remained in hot pursuit of the go-fast with the assistance of unit’s Over the Horizon IV cutter boat. CBIG unifies efforts between US Customs and Border Protection, the US Coast Guard, US Immigration and Customs Enforcement, the United States Attorney’s Office for the District of Puerto Rico, and Puerto Rico Police Joint Forces of Rapid Action, in their common goal of securing the borders of Puerto Rico and the US Virgin Islands against illegal migrant and drug smuggling.